In their first attempt at a David Mamet play, New Jewish Theatre chose wisely with his 1988 classic of Hollywood BS, “Speed-the-Plow.” There’s quite liberal use of Mamet’s favorite “F” word throughout- but if you’re a Mamet fan, you’re used to that. Nevertheless, this is a smart, clever and appealing production due to some excellent direction and three strong actors. Bobby Gould has recently been promoted to a studio head with one big “green light” decision a year (a script that he can approve with little or no fuss). His buddy, Charlie Fox brings him a script that’s been languishing in a pile somewhere for some time but a big star from the studio “across the street” reads it and wants to do it. He tells Charlie that he’s ready to cross over and do the picture with him. Dropping this on Bobby’s desk is a cause for celebration and the two continue to BS and heap faint praise on each other throughout most of the first act. However, Bobby has a temp at the reception desk and, when she delivers the coffee, she delivers enough charm to get a rile out the constantly horny Charlie. A bet ensues that Bobby can’t get this new girl, Karen, to go on a date with him and five “C’s” is the prize. Reluctant at first, Bobby agrees and he gets the ball rolling by offering her a miserable script about radiation that he and Charlie had both agreed was nothing more than a “courtesy read” as a favor to a studio mucky-muck. When she gushes over the novel later in Bobby’s apartment, he finally hits the jackpot as she agrees to go to bed with him. The second act really picks up and it’s a short one but gets right to the point. Now that Bobby has dumped the “star” vehicle in favor of the radiation script, Charlie confronts he and Karen with unexpected results. It’s a brilliant piece of writing by Mamet that gets right to the foibles and shallowness of the industry and of mankind in general. Christopher Hickey is brilliant as Bobby. He has the power now and, as we cut through the pile of hooey he and Charlie are laying on each other, we see the true nature of the beast in his confrontation with Karen. Powerful in his relentlessness, Michael James Reed plows through Charlie’s character like a fast moving freight train. He is unstoppable and, in the second act, he epitomizes the true Hollywood ethic. Sigrid Sutter’s Karen is a testament to the power of woman. She dallies through the flattery and charm both men bestow on her and then tries to outrun her true intentions (which are never really quite clear). But she’s got the moves and she uses them to the best of her ability. 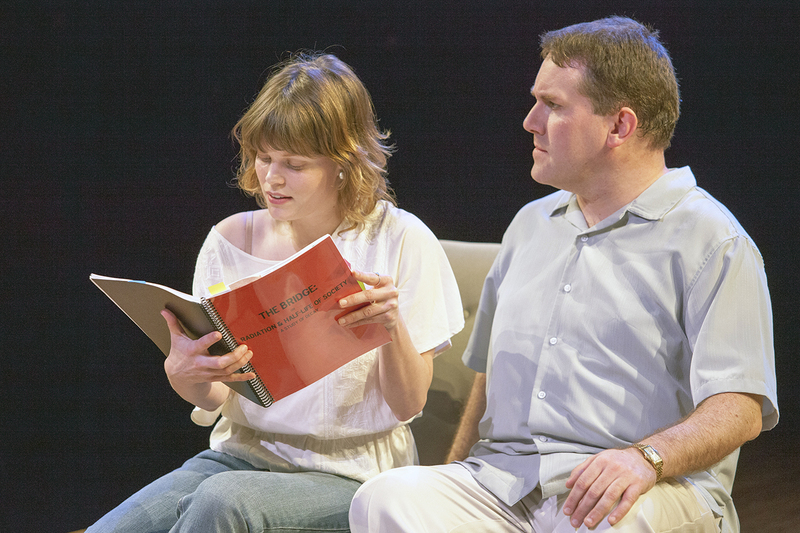 Tim Ocel has directed “Speed-the-Plow” with a clear mastery of David Mamet’s script. He hits all the right notes and, at times, overpowers us with the cutthroat business of making movies. Dunsi Dai’s magnificent set design is simple yet effective and offers a quick transition from office to apartment during the long first act. Maureen Berry’s lights are perfect and the costumes of Michele Friedman Siler work with the possible exception of the suspendered “high waters” of Bobby in the first act and his almost tripping over the longer suit pants in the second act. A nice sound design by Matthew Koch included movie themes from “Casablanca,” “Ten Commandments” and others to get us into the mood before each act. This is powerful stuff and a real departure for New Jewish but one that fits into their season beautifully. If you missed the “F” word in the recent Mamet one-act, “The Duck Variations” at Mustard Seed, he more than makes up for it in this superb production. 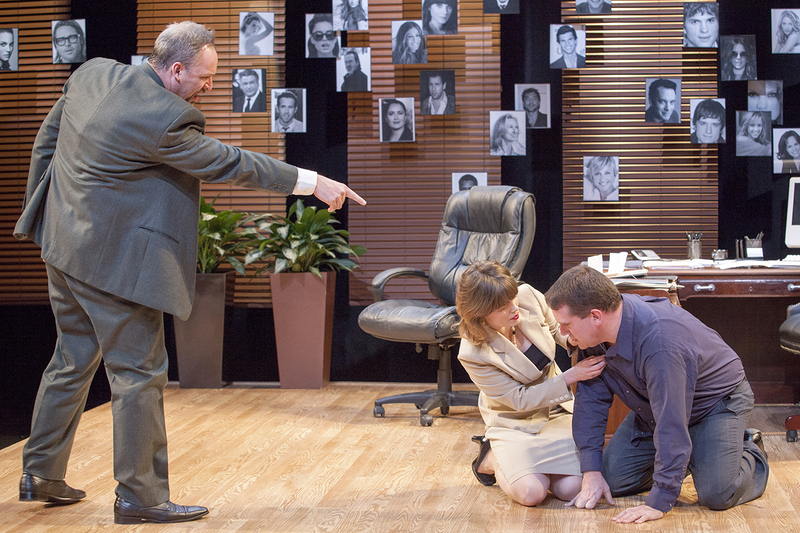 See “Speed-the-Plow” through February 24th at the New Jewish Theatre. Call 314-442-3283 for tickets or more information. This entry was posted on February 18, 2013 at 9:43 pm02 and is filed under Uncategorized. You can follow any responses to this entry through the RSS 2.0 feed. You can leave a response, or trackback from your own site. Just an FYI – no language was changed or omitted in this production. Besides that being artistically suspect, doing so would be a violation in the terms for obtaining the rights. Mamet, in particular, is very very clear about what is allowed and not allowed in productions of his scripts, and editing language would never be tolerated. 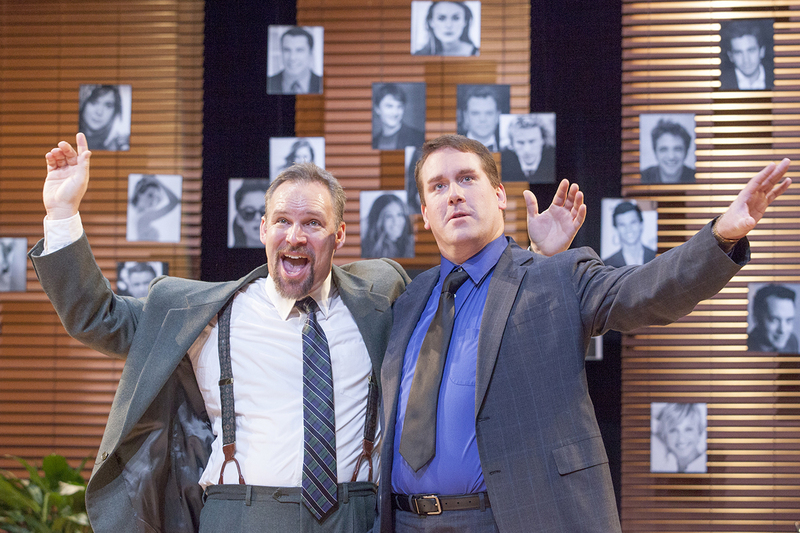 Mr. Mamet is one guy you don’t want get angry! Well, I call her (and him) just about everything else in the book, that’s for sure! Its actually kind of interesting that you remember it that way, as more or less, that’s what Mamet is saying about women, right?? The subtext was coming through loud and clear then! Hope to see (and meet) you on the 18th! !